Wine Review: Casa Larga Chardonnay CLV | Wine Splash! Who says only good Chardonnay comes from California?! Out of Fairport, New York in the Finger Lakes region, we found a wonderful Chardonnay that is fresh and full of flavor! (and only $12.99 a bottle!). We were wine touring with friends in the Finger Lakes area and it was recommended that we stop at Casa Larga Winery. This Chardonnay is straw yellow in color with nice long legs in the glass. Fantastic nose bursting with tropical fruit, ripe citrus, orange blossom, ginger and butter. Yes, we were enticed! On the palate, it was a menagerie of flavors! Young pineapple, citrus, and other tropical fruits upfront. Medium bodied with a soft mouthfeel. A nice long finish with flavors of vanilla, buttery toffee, spice, and oak! A perfect balance of fresh fruit, spices, and oak. Every sip brought you another new exotic flavor! This would pair well with a broasted chicken, chicken alfredo, pork roast, a summer salad, or medium to sharp cheeses. We found out later that this Chardonnay was aged in stainless steel and then blended with 4 types of oak aged chardonnays – Hungarian, Yugoslavian, American, & French (non vintage). 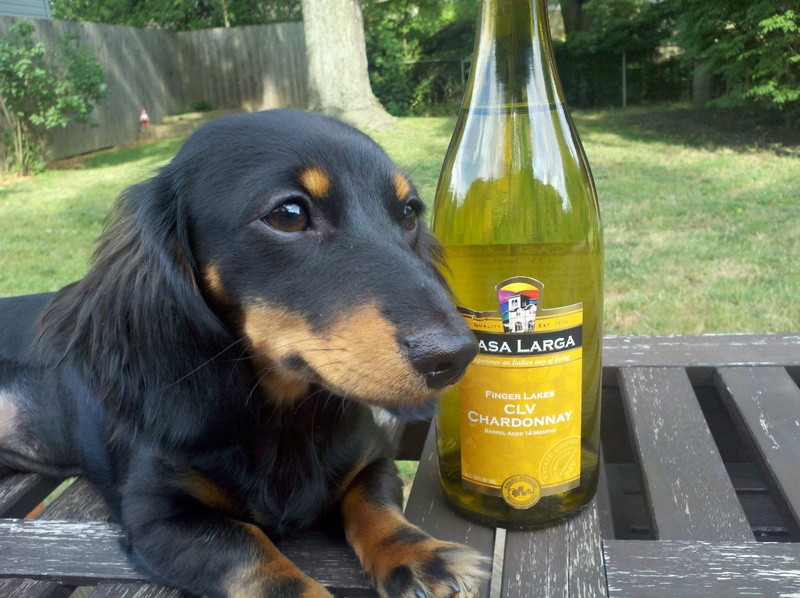 We truly enjoyed this Casa Larga Chardonnay CLV and for price and flavor, it is a definite Best Buy! On our SiNoTas scale, we give this Chardonnay an A. We do not live in NY but we are calling the winery this week to have them ship us a couple more bottles. This is a great food wine, cheese wine, or on its own just relaxing on the patio! The puppy in the wine photo is our new Wine Splash dog mascot, Daisy! She will be helping us review wines and giving her own opinions. She has a great nose and a l-o-n-g finish herself! 🙂 We love our new Wine Dox and she rates this wine 4 Paws out of 5. WineSplashing!